Source: CICH graphic created using data adapted from Health Canada. 2010. The Report on the Findings of the Oral Health Component of the Canadian Health Measures Survey. 2007-2009. http://publications.gc.ca/collections/collection_2010/sc-hc/H34-221-2010-eng.pdf -accessed July 30, 2017. 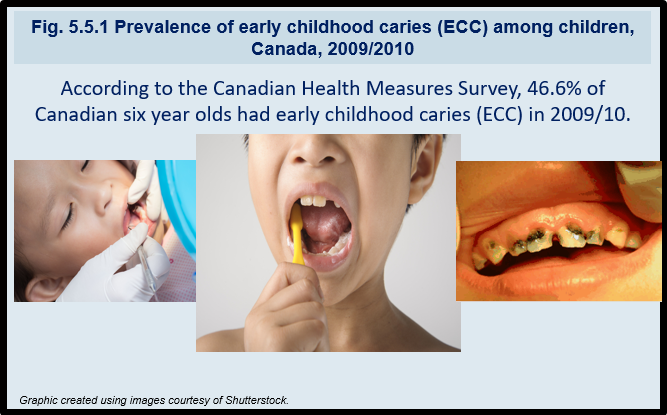 According to the Canadian Health Measures Survey, 46.6% of Canadian six year olds had early childhood caries (ECC) in 2009/10. This means many Canadian children have one or more decayed, missing, or filled primary teeth. 1Schroth RJ, Harrison RL, Moffatt ME. Providing timely dental treatment for young children under general anaesthesia is a government priority. Journal of the Canadian Dental Association 2007:73(3):241-3. 2Canadian Dental Association. Report of early childhood caries. 2010. https://www.cda-adc.ca/_files/position_statements/earlyChildhoodCaries.pdf-accessed July 30, 2017. 3Canadian Institute for Health Information. Treatment of preventable dental cavities in preschoolers: A focus on day surgery under general anesthesia. 2013. https://secure.cihi.ca/free_products/Dental_Caries_Report_en_web.pdf-accessed July 24, 2017. 4Canadian Institute for Health Information. Treatment of preventable dental cavities in preschoolers: A focus on day surgery under general anesthesia. 2013. https://secure.cihi.ca/free_products/Dental_Caries_Report_en_web.pdf -accessed July 30, 2017.